Notes: WILL NOT FIT UNLIMITED. Includes passenger area, rear cargo area and wheel wells. Does not include jute padding. 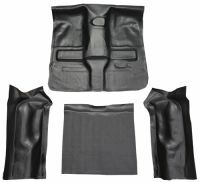 Our 1997-2006 Jeep Wrangler custom molded vinyl flooring is Heat and Pressure Molded to the original floor pan. It is made with Top Quality materials for a heavy duty and long lasting product. This aftermarket vinyl flooring fits your 1997-2006 Jeep Wrangler Complete Kit just like OEM when installed and is Guaranteed to fit, with no defects. May require trimming to install. See our Auto Carpet Install Instructions for details. There are times when carpeting is not the appropriate floor covering for a vehicle. From the pickup trucks and SUVs that spend their time off-road or at the construction site to a taxi cab shuttling people through the city, our vinyl flooring is the heavy duty alternative. This item will not have the holes cut and may be shipped slightly oversized around the edges. This item is custom made after the order is placed, and typically ships within 2 business days.